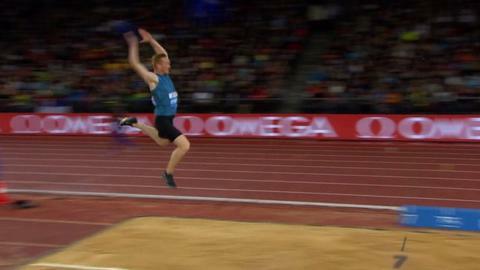 Britain's Greg Rutherford said winning the IAAF Diamond League long jump title has helped him overcome his "demons". The Olympic champion jumped 8.32m to beat America's Marquis Dendy in Zurich on Thursday to take the title. Rutherford, who won World Championships gold last week in China, believes the victory has answered his critics. The 28-year-old said: "I put any demons to bed that people might have thought it was a bit flukey again, as everybody keeps saying." Rutherford added world gold to his Olympic, European and Commonwealth titles but still faced suggestions he had been lucky as his main challengers failed to hit form on the day. At the Diamond League final in Zurich, Rutherford secured a title that was built on victories in Birmingham, Oslo and Stockholm. Although his night's work earned him $50,000 (£32,773), Rutherford was clearly most delighted to have triumphed over his competitors, who he feels have not appreciated the effort he has put in. The Milton Keynes-based athlete told BBC Sport: "After the World Championships people were saying, 'we're going to take him in Zurich, he's the one we're going to take down' and 'fluke' and whatever else. "My competitors think I don't want it as much as them but I want it more." "He helped me win an Olympic title. He is, for me, the greatest coach in the world and going into another Olympics I want to win that as well and retain my title," said Rutherford. "It makes sense to go and work with Dan. I think I'll be there for five or six months in Phoenix, Arizona, and hopefully I can have a very solid training block there, come out for the summer next year and do the same again as what I did this year." This was the first of the two Diamond League finals taking place, with the next scheduled for 11 September in Brussels. Shara Proctor, who won silver at the World Championships, came third in the women's long jump with a 6.58m leap in the fifth round. Her fellow Briton Jazmin Sawyers was fourth with 6.55m and Lorraine Ugen came eighth spot with a jump of 6.31m. Britain's Lynsey Sharp finished second in the 800m with a time of one minute 59.37 seconds, behind Kenya's Eunice Jepkoech Sum, who ran 1:59.14. Shelayna Oskan-Clarke was 11th. Daniel Talbot came eighth in the 200m in 20.70 seconds, while fellow Briton Charlie Grice was 10th in the 1500m. Another GB athlete, Rabah Yousif, was fifth in the 400m in a time of 45.30 seconds, with America's LaShawn Merritt victorious in 44.18. Jamaica's double world and Olympic champion Shelly-Ann Fraser-Pryce added the 100m women's sprint Diamond League title to her growing list of honours, winning in 10.93 seconds. The action in Zurich will be broadcast on Saturday, 5 September at 14.30 BST on BBC One and on Monday, 7 September at 11.00 BST on BBC Two.